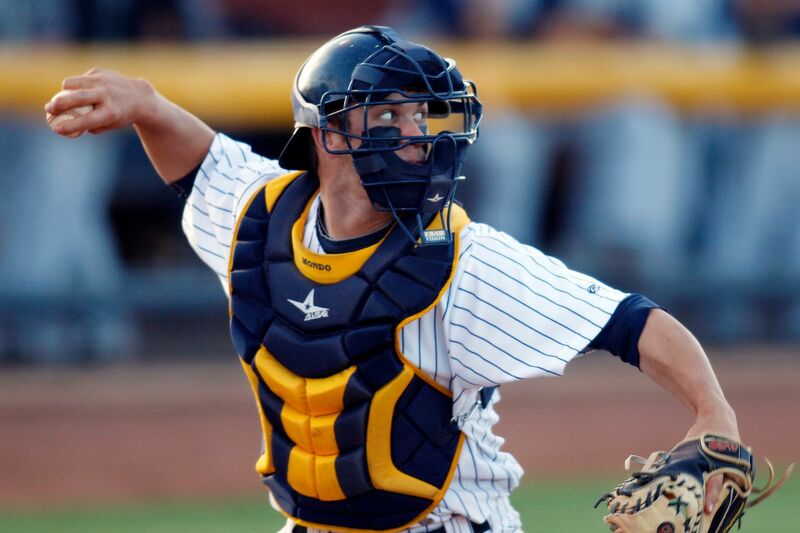 Bryce Harper played catcher while at the College of Southern Nevada, and Phillies manager Gabe Kapler once argued the star should return to that position. CLEARWATER, Fla. — In 2013, a guest columnist for the website of a Boston sports-radio station wrote that the Washington Nationals should consider turning Bryce Harper back into a catcher, further proof that no baseball team in its right mind should ever hire a sportswriter to be the manager. But what if the sportswriter in question was Gabe Kapler? Indeed, as they begin their manager-superstar relationship, Kapler is perfectly happy to keep Harper in right field — and not just because the Phillies traded for All-Star catcher J.T. Realmuto. Harper has been an outfielder since his first day as a professional in 2010, and not even Kapler — as creative and deep thinking as any manager in the game — would seriously consider putting him back behind the plate, where he played through junior college at the College of Southern Nevada. But six years ago, as he sat behind his computer screen and tapped out 1,200 of his finest words for WEEI.com, Kapler had a legitimate argument, albeit one that was both outside the box and seemingly counterintuitive. Harper was sidelined at the time with a knee injury that stemmed from a violent, face-first collision with the scoreboard on the right-field wall at Dodger Stadium. He was 20 years old then, 11 months removed from his major-league debut, and he didn’t apologize for an all-out style of play that detractors labeled as reckless. As a former major-league outfielder who was beginning a media career with Fox Sports, Kapler admired Harper’s hard-nosed attitude. But he also feared that it would lead to a serious injury. And he reasoned that moving back to catcher, although a more physically demanding position than the outfield, would help save Harper from himself. Bryce Harper dives to catch a Giancarlo Stanton hit during a March 13 spring-training game against the Yankees. "He plays the game so hard," Kapler said after re-reading the column Sunday before managing the Phillies in a spring-training game. "We see it. On the minor-league side [Saturday], he plays nine innings, he steals bases, he's diving all over the place. I think the idea behind the piece was, this guy is so gifted, he's so talented that he could do anything. "I do think he could've stayed at catcher and been incredible, mostly because I believe his talent and athleticism will shine through no matter where he is on the field. I had seen video of him behind the plate and thought, coupled with his bat, he could be the greatest catcher ever to play the game." But it was more than that. Kapler played with former Red Sox catcher Jason Varitek, who was known for his attention to detail and laser-sharp focus. He recognized a similar look on Harper's face when he watched him play on television. Over the past month, Kapler has seen it firsthand. In particular, Kapler was struck by Harper's intensity in the batting cage. Of course, the Nationals were never going to listen to some writer. What does the media know anyway? Harper, for his part, used to volunteer every year to be the Nationals' emergency catcher. They never took him up on it, steadfastly refusing to even consider putting their star right fielder and face of the franchise behind the plate. Kapler's career as a sportswriter was short-lived, too. He wrote a series of columns and worked his television analyst gig through the 2014 playoffs before taking a job as the Los Angeles Dodgers' director of player development. So, maybe sportswriters do have a point every now and then.